Wes Stanton takes a trip on the Regent Seven Seas SS Explorer and reports back from the Iberian coastline. Personally, I find the aging process to be, on the whole, OK. I may not be the young buck I was once, but with advancing years comes the realization that what achieves happiness might not be what you thought it was as a younger chap. Fitness, health and long-term friendships become increasingly important, as do the quality of one’s life experiences. But there is one aspect of maturation that I can’t escape, and I recall, as a young man, being quite unable to comprehend: the fact that older people simply seem to get grumpier with advancing years. I myself am now experiencing this but I’m glad to say it’s only in certain situations and when it involves a certain strata of society: young people. I’m sorry, but I am somewhat fed up with being referred to as “mate” by someone serving me in a supermarket checkout – or worse, people carrying on private conversations while there is a customer in front of them that they should jolly well be focused on serving. For example, a drive-through trip to a local Costa recently was made all the more edifying when the young lady serving us as five to midday announced loudly that there was little chance she’d get off her shift on time today and she was really not happy about it. How staff relate to customers in Britain today is little short of shameful. And it makes me very grumpy. Very grumpy indeed. The overweening sense of entitlement to a job amid scant regard for actually relating to customers in a civil manner, and remembering that it is those customers that actually pay the wages I find somewhat irksome. But I recently managed to escape the confines of Britain’s perimeter, and took a short break around the Iberian coast on the Regent Seven Seas Explorer. Dubbed the ‘world’s most luxurious ship by the numbers’ it might seem a bold claim, but from personal experience, and by the numbers, everything about the vessel cannot fail to impress. My command of Spanish is downright awful, but after gesticulating and pointing for 10 minutes or so with a taxi driver at Malaga airport, we were of an accord, and were driven across town to the port. As we turned the corner on the straight near our destination, there she was in all her resplendent glory. If you haven’t set eyes on her physically, no photograph can do her justice to her sheer size, and it is difficult to appreciate just how awesome this ship is. I use the word awesome in its true context, unlike when you hand over a payment for a coffee in Costa and the member of staff uses the word in relation to thanking you for buying a coffee. At 55,254 gross-registered tons the all-suite, all-balcony ship boasts one of the highest space ratios and lowest crew-to-guest ratios in the cruise industry. There is 51,909 square feet of balcony space; 45,876 square feet of marble across the 375 guest suites; and 473 chandeliers throughout the restaurants, lounges, suites and corridors – and with a maximum 750 guests on board, their needs are served by 552 crew spanning 41 nationalities, which gives a ratio of 1.36 guests per crew member. But size alone is not the most impressive aspect to this ship. 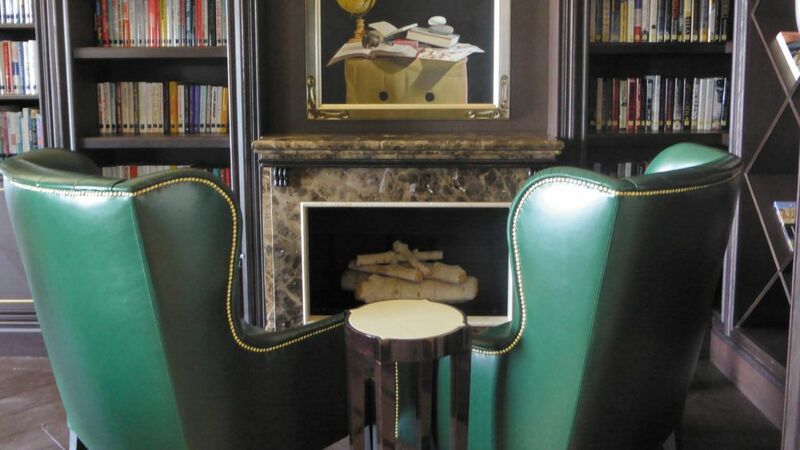 The moment you set foot into the lobby, you cannot fail to be impressed by the opulence of the interior. Chandeliers hang commandingly from the ceilings, works of art adorn the walls and, as a guest, you are made to feel special. Each member of staff greets you and takes genuine interest in your welfare at every stage of the experience. It sounds somewhat over the top perhaps, but there is genuine interest in providing good service from the staff. Food and drink is included throughout the cruise (though there are of course opportunities to pay for drinks if you want something very special indeed), and Seven Seas Explorer offers a diverse variety of different gourmet dining experiences. French cuisine with a modern twist? Try the Chartreuse restaurant, with a chic Parisian fine dining ambiance that takes its moniker from sultry chartreuse-coloured glass panels in the surroundings. And try this for food transcending nourishment and becoming art: hand-cut Charolais steak tartare in a hazelnut-Dijon emulsion topped with Perlita caviar d’Aquitaine; roasted Cévennes rack of lamb with rosemary-mint persillade and sugar snap pea sauce; and poached Brittany blue lobster tail glazed with caramelised lobster roe butter on a bed of Sologne white asparagus and Romanesco broccoli. Asian dishes take your fancy? Pacific Rim offers delightful Pan-Asian dishes, such as tempura-battered Canadian lobster with shiso leaf finished with an orange ponzu sauce and spicy mayo; a miso-spiced black cod wrapped in hoba leaf accompanied by pickled daikon and spicy den miso; and grilled Korean barbecue lamb chops, wok-fried beans, eryngii mushroom and gochujang dressing. Then there is Prime 7, based on London club-style steakhouses; the Compass Rose restaurant (think Savoy hotel and you won’t be far off the kind of dishes available here); La Veranda, by day Italian Riviera 1960s glamour with either indoor or alfresco dining, and transforming into a fine-dining restaurant, Sette Mari La Veranda, each evening for dinner. With the Pool Grill rounding off the selection (come-as-you-are dining venue) with open-air and glass enclosed seating burgers, grilled fresh seafood and sandwiches amid wonderful views, the seven restaurants are a key part of this cruise experience that offers the right mood and food whatever your preference. Accommodation wise, the Seven Seas Explorer features an unprecedented collection of luxury suites, offering a superior level of elegance, design and comfort across all 10 different category levels. Each spacious, well-appointed suite features an intricate design with lavish details and oversized bathrooms highlighted by rich marble and decorative tile. All suites are designed to provide guests with an ambiance that exudes luxury while also offering a warm and comfortable respite. Seven Seas Explorer features the largest balconies in the cruise industry, offering a spacious outdoor oasis for guests to enjoy the scenic vistas and ocean breezes. 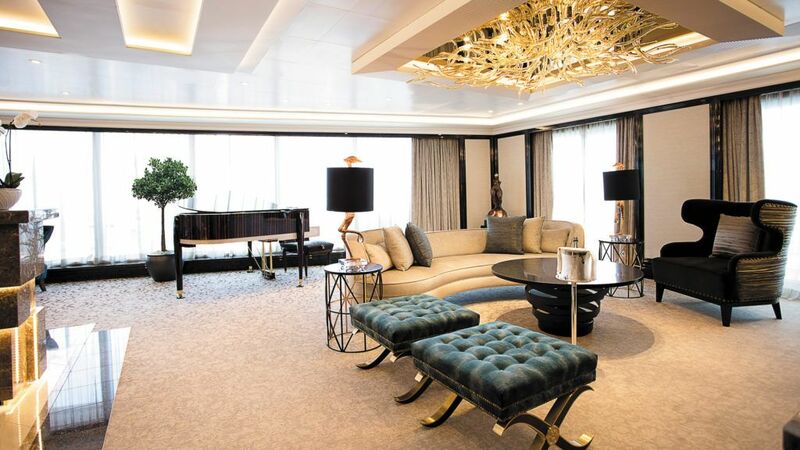 Of these, the ship’s masterpiece is the highly acclaimed, 4,443 square-foot Regent Suite. The lavishly appointed two-bedroom suite features an in-room spa retreat, a first at sea, that comes complete with unlimited complimentary spa treatments from onboard spa Canyon Ranch. 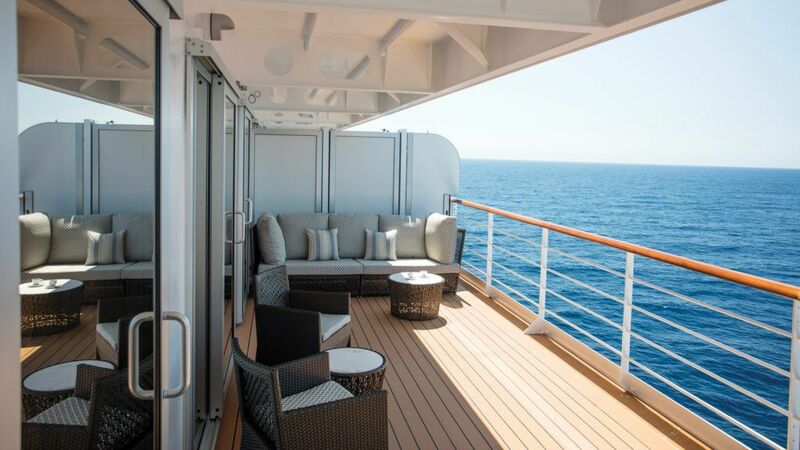 The outdoor, glass-enclosed sitting area off the dining room provides 270-degree views over the ship’s bow. The living room features a black marble bar with chic black lacquered stools and a custom Steinway Maroque piano by famed designer Dakota Jackson. On board entertainment is also something special. The ornate, two-tiered, 694-seat Constellation Theatre includes a nightly show, and during my trip, I was treated to an evening with sounds of the sixties – delivered with all the panache and aplomb of a West End musical – and an evening with the unusually talented pianist, Harry The Piano, one of the best improvisers you could wish to hear irrespective of his choice of instrument. Other facilities include a fully-equipped gym with decent equipment and running machines, though they’re not to my taste. I prefer my runs outdoors (there is a running track on the top deck), so my shore-trips to Cadiz and Lisbon took in the sights while running in the warm Iberian climate at a relaxed pace. To ease my aching muscles after a 4-mile run turned into 10 by taking a wrong turn, the lavishly appointed, state-of-the-art Canyon Ranch Spa Club soothed my broken body with massages, steam rooms and fragrance-infused showers. Bliss. If doing your own thing isn’t your thing, there is a multitude of organised trips available. Barcelona’s food markets; making cannoli from a Sicilian pastry maker; pesto, pasta and lunch in Portofino; and kitchen master classes in Valencia to highlight but a few. But for me, despite being surrounded by magnificent artworks, exquisite interior décor and an atmosphere humming with opulence, the customer services on SS Explorer has to be experienced to be believed. In times when, on the high street or in the shopping arcade, ignorant staff call you ‘mate’ or complain about leaving on time without a hint of irony or sarcasm, I found the most refreshing part of the experience to be the attentiveness and demeanour of the crew on-board. Good customer services comes from the top in any organisation, and it was delightful to find the on the SS Explorer, customer service values remain No.1 priority on this cruise company’s agenda. For more specific itinerary details or for general information about Regent Seven Seas Cruises, guests can visit www.RSSC.com, call 02380 682 280 or contact a professional travel agent.